For the third quarter, Abercrombie & Fitch earned $23.9 million, or 35 cents per share, up from $10.1 million, or 15 cents per share, a year ago. On an adjusted basis, Abercrombie earned 33 cents per share, 13 cents more than analysts’ expectations. The company reported revenue of $861.2 million, topping analysts’ estimates for $853 million. Abercrombie & Fitch delivered strong same-store sales for the third quarter. Sales at stores open for at least 12 months were up 3 percent, outpacing the 1.6 percent increase Wall Street was looking for. Same-store sales were up 6 percent in the U.S., while they were down 3 percent internationally. The company’s flagship business and its Hollister brand both recorded solid quarters. Same-store sales at Hollister were up 4 percent for the quarter, while sales at Abercrombie increased 1 percent. Horowitz said the retailer recorded record sales between Thanksgiving Day and Cyber Monday. 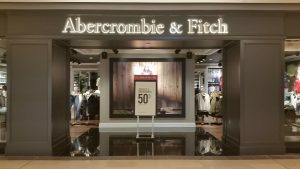 Abercrombie & Fitch is sticking to its fiscal year 2018 same-store sales forecast of an increase of between 2 percent and 4 percent. For the fourth quarter, the company is calling for net sales to fall in the mid-single digits and for same-store sales to rise by the low-single digits. The company announced that it now expects to close fewer stores this year “based on improved performance and successful lease renegotiations.” The company now expects to close 40 stores by year-end, down from its previous estimate of up to 60 closures. The company’s shares surged nearly 25 percent after the release of the results. Before the stock surge, Abercrombie & Fitch shares had been down about 3 percent from a year ago.